Inspired by an actual event. Jeremiah Watson meets the Jersey Devil! Chatsworth blueberry farmer, Jeremiah E. Watson, forty-nine, claims to have been STOPPED by the Jersey Devil while crossing the White Horse Pike this wednesday past. "He scared the daylights out of me, all right." "...and old-fashioned tale of faith, hope, and redemption." Lee Albright and Skip Rose begin the story by bringing the 1938 encounter to life, in their electrifying screenplay, "The Jersey Devil-The Legend Lives". Present Day and the start of an Indian Summer weekend in the Pine Barrens. 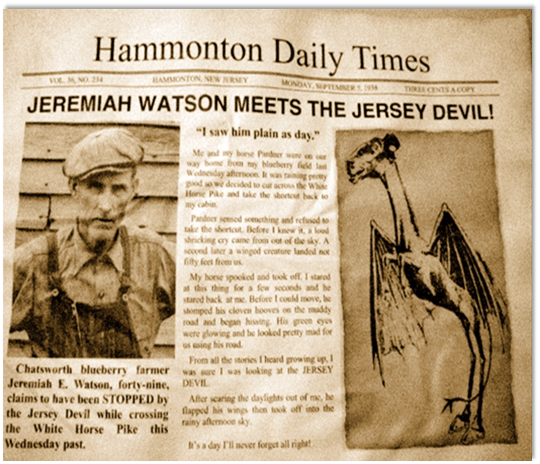 In 1938 , no one believed Jeremiah's story about his encounter with the Jersey Devil except for his wife and young son Jesse. Now in his eighties, Jesse works in a café in the small town of Chatsworth. After sharing his father’s pain on that dreary day so long ago, the old man still insists there is a real Jersey Devil alive and well living somewhere in the Pine Barrens. So much so that he has spent the past seven decades attempting to redeem his father’s name. Jesse gets his chance when the actual Jersey Devil mysteriously reappears after seventy years of hibernation. Upon resurfacing from his underground lair, the legendary creature has an unfortunate confrontation with a local teenager, Bobby Bartlett. This incident triggers a series of events which ultimately lead to the beast's capture and his ultimate demise ...or so it seams. This screenplay is so engrossing, I read it in one sitting. The authors flesh out the characters with rich detail, and with an economy of words, do the same for the action. Romance, humor, action, wonder, fear, horror--it is all there. "The Jersey Devil- The Legend Lives" is a gripping, intelligent thriller of a screenplay. A great story, interesting and real characters, smart dialogue and a menacing beast.